The many electric motoring announcements in London on Tuesday seemed to suggest the start of an electric car revolution in the UK. Soon after a ceremony at Guildhall in the City, where the government revealed a list of nine electric cars eligible for a £5,000 subsidy, the focus moved on to electric taxis. In his final air quality strategy, London Mayor Boris Johnson set out his plan to phase out old polluting black cabs in an effort to improve air quality. This includes "a £1m fund to encourage taxi owners to upgrade to low emission vehicles such as electric taxi cabs", the Mayor said in a statement. At a separate event in central London, the German carmaker Volkswagen unveiled an electric concept taxi that could go some way to fill the void once an estimated 1,200 of London's most polluting taxis fail to have their licences renewed. Volkswagen's tiny taxi allows a driver to take two passengers plus luggage, and should have a range of about 300 kilometres (186 miles) on a full charge. "In the future, mobility in city centres will be restricted by low emission zones that you can't enter with private vehicles, so in such cities taxis are about mass mobilisation," Volkswagen's design director Klaus Bischoff predicts during in an interview with BBC News. Volkswagen and others in the industry often see government initiatives as business opportunities, and electric motoring subsidies are no different. "Low carbon and the transition to low carbon is a tremendous opportunity for the UK motor industry," says Paul Everitt, chief executive of motor industry body SMMT. All this effort by government and companies suggests electric motoring is about to become mainstream. But that is unlikely just yet, according to Stephen Glaister, director of the RAC Foundation. 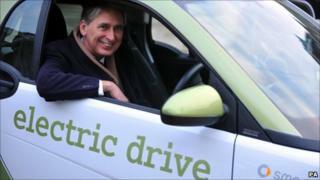 "The £43m [government subsidy for electric vehicles] being made available until early 2012 means at least 8,600 will benefit from the subsidy," he says. However, "while this makes ultra-green cars cheaper, it doesn't make them cheap", he adds. Put this into context of the 28 million cars on the road in the UK and annual new car sales of around two million, and it seems clear that much more is needed. "Clearly we are still a long way from an affordable mass market for these vehicles," says Mr Glaister. But if, as many predict, the shift from cars with conventional combustion engines to electric cars is set to remain slow for years yet, there is another, less visible, electric motoring revolution taking place. "There's going to be hybridisation and electrification of vehicles in many different ways," according to Stefan Suckow, hybrid sales director with Johnson Controls, which makes electric car batteries for several manufacturers. At the most basic level, this relates to how carmakers are eliminating the direct mechanical connections between components and the engine. For instance, fuel consumption can be cut by about 1% by switching from conventional power steering to electronically controlled power steering. Other incremental improvements range from solar panels that run the air conditioning during stand-still, so fuel is not used to cool down the car, to small electric motors tucked away in the doors and powered by batteries that are charged when a car is braking. These electric motors help with acceleration, which means cars can be fitted with smaller and thus cleaner engines. Industry officials are eager to point out that small cuts in the fuel consumption and emissions of millions of cars add up and have a greater impact overall than what might still be a relatively weak take-up of electric cars.